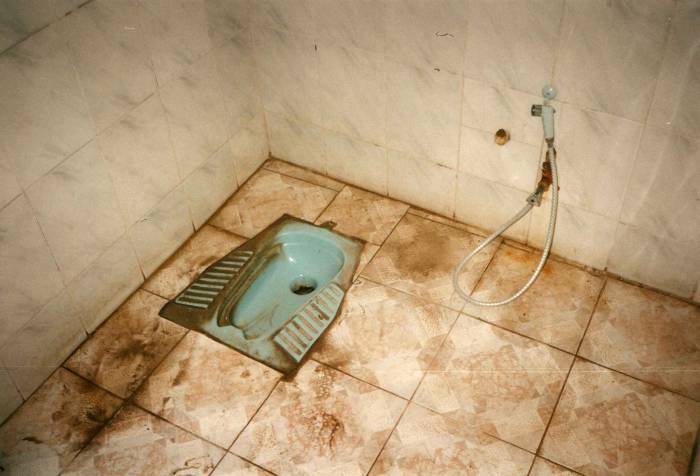 Egyptian toilets tend to be pretty minimal. Unless you're in a place catering to western tourists, it's all squat toilets instead of raised commode seats, and water instead of paper. Done right, this can make for a very clean toilet. Of course, in Egypt many things are not done right. Here is a selection of Egyptian toilets, from Dahab and a mountain summit in the Sinai peninsula, to a train along the Nile River, and a ferry to the Jordanian port of Aqaba. Dahab, on the east coast of the Sinai Peninsula in Egypt, is a great place to relax. The so-called Bedouin village up the coast from the luxurious resorts is the best place to stay. This is a classic floor-mounted squatter with integrated plumbing. The shower head mounts on the wall of the room, and the toilet drains the entire room. The hose/sprayer also reaches the toilet itself for hygenic purposes. 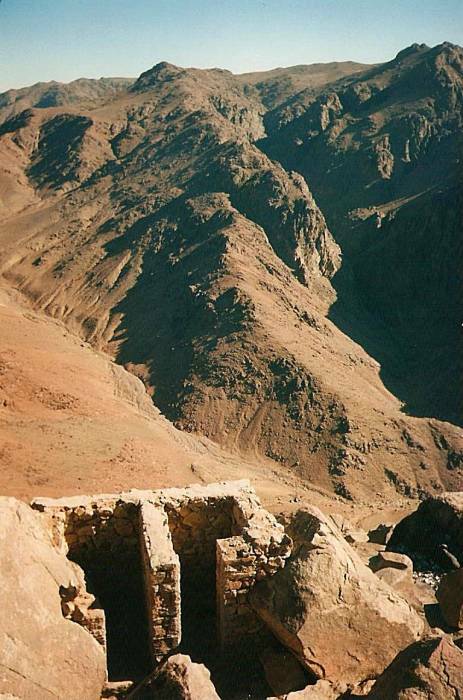 This pit toilet has been constructed from local loose stones, just below the summit of Mount Sinai, Egypt. See pictures of my trip to Egypt for much more on Mount Sinai and Mount Sinai Egypt in general. 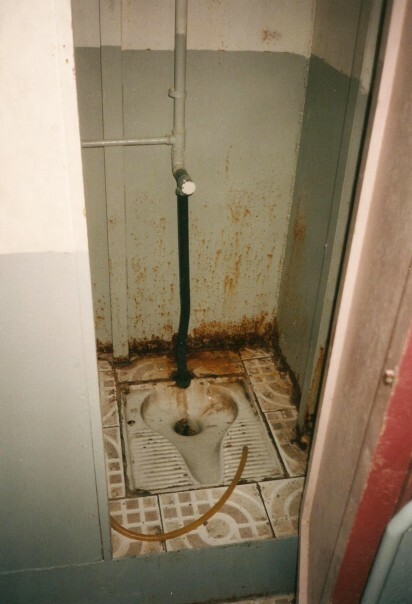 Also compare this to the pit toilet in the Besparmak Daglari of Turkey. This one is also filed under Biblical Toilets, Old Testament as well as Loos With Views. 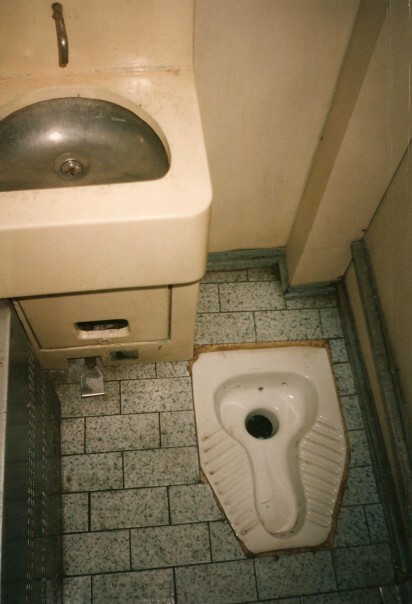 This squat toilet is found on board the Egyptian passenger train on Aswan-Luxor-Cairo route paralleling the Nile. This toilet is on an Egyptian ferry on Nuweiba-Aqaba route between the Sinai and Jordan.